The Ikpeng tribe of the Xingu Park in Brazil have written an impassioned letter demanding that plans to build a hydroelectric dam on their river be halted. The dam, Paranatinga II, is planned for the Kuluene river, which runs through the Ikpeng’s land. It is one of several dams to be built along the Xingu river and its tributaries. ‘The Kuluene river is the source of food for the peoples of the Xingu, we need it to feed ourselves, we use it to bathe in and to cook our food in, the fish come up the river to spawn, the animals drink the water. ‘All around the Xingu there is the great soya monoculture, and deforestation increases every year with timber being felled and sold illegally. The rivers are being polluted by pesticides and burning. The gallery forests are being cut down causing silting, and now with this dam the problem is more serious. It will put our lives, the lives of the animals, of the fish, of biodiversity, the fauna and flora, all at risk. 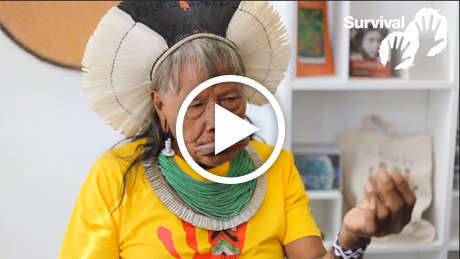 ‘We are indigenous people of the Xingu and we don’t want this dam on the river. We want the fish and the fauna and flora, we want the river to be clean, we want water that feeds us and quenches our thirst, water that fills our bodies, the lakes with their fish, the forest with animals, water for everyone. ‘In 1500 Brazil was invaded and the Indians exterminated but we still exist. Brazil was not ‘discovered’ because we were already here. ‘We’re not holding back the country’s progress. We’re defending our rights to life, to our land, to our river ecosystem, to respect for indigenous peoples and our way of life, to our culture and our language. We want this dam to be stopped. We don’t want to be tricked. 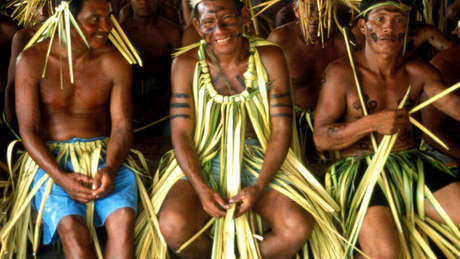 We want our territory to be an example of environmental, cultural and linguistic preservation. ‘We are alive today because we have always fought for our rights. We will not let this dam be built.